Mezuzahs and Mocktails was a big hit ! 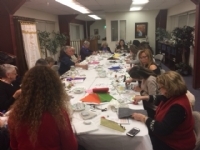 25 women gathered together to learn about the Mitzvah of Mezuzah and create their own Mezuzah case masterpiece with local artist Anna Abramzon. 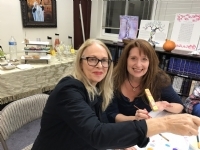 The evening kicked off with a “Get to know You” game , followed by a video presentation , a short talk on Mezuzah with Adina Landa, following by art, desserts, and mocktails! Menorahs & Martinis was a hit!! 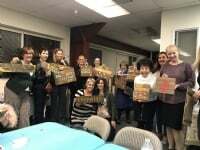 A wonderful group of women coming together to build stunning granite Menorahs to light over Chanukah. 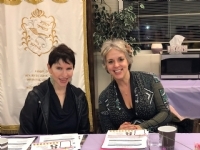 We bonded over drinks and dessert, as we discussed Chanukah memories and inspiring Chanukah messages from our Rebbetzin. 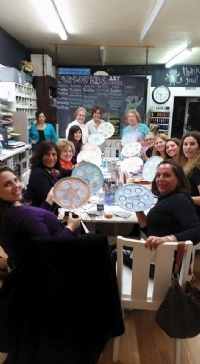 A meaningful ladies night out. We enjoyed a delicious Latkas and Lattes. 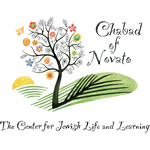 A beautiful jewelry sale , a musical Menorah lighting and special video presentation and discussion about the miracles in our lives. What a fun, cozy and insightful evening. 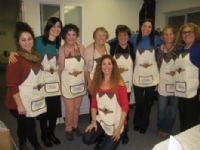 We gathered together to learn the Mitvzah of Kosher with a hand-on cooking demo, and tasting of every delicious dish. 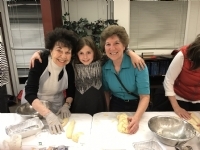 Hadassa Landa presented special laws of Kosher as well as her favorite recipes!